MP Food Pantry Finds a New Home | Grand Central Magazine | Your Campus. Your Story. The formerly known mobile food pantry now has a permanent home at 1114 West High St. in Mount Pleasant. 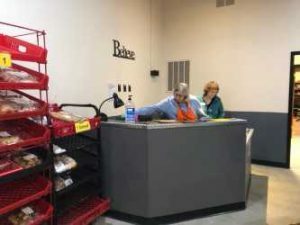 With their new location and regular hours, it has made food assistance more accessible to the residents of Isabella County. The food pantry is housed with multiple other community services under one roof. Walking into the building is the common area, where you can find people talking and playing games among each other. On the left is the Care Store, that supplies household supplies and personal hygiene to local residents. 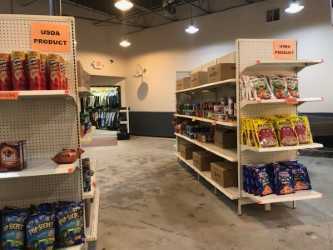 A couple doors down is the Clothing Inc, which provides free clothes to residents who are in need and the food pantry is located in the back end of the building, helping to supply a sustainable food items for families. Deborah Skinner began working for the food pantry 14 years ago through the First Presbysterian Church. The food pantry partners with Greater Food Bank, which allows them to purchase food a reduced rate. They hold a variety of options of fresh produce, pasta, soup, cereals and much more. 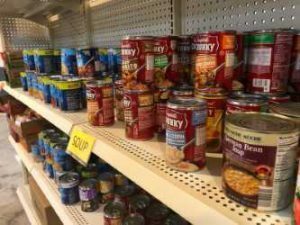 The food pantry is constantly growing, the location here in Mount Pleasant will be the second pantry to receive a walk in freezer in the state of Michigan. Once you make a appointment with the food pantry your eligibility for food service will be reviewed. If you qualify for the food pantry, a volunteer will assist you around the store with a USDA form that has the guidelines on how much food you will need to shop for, based off family size. The food pantry also has their own nutrition club. Volunteers come together to pack more than 650 lunches, twice a month, for elementary students. The food pantry is always welcoming volunteers. For more information call 989-863-4449. Separator image Posted in Food & Wellness and tagged with Chanda Crenshaw, Food and Wellness, food pantry, volunteering.